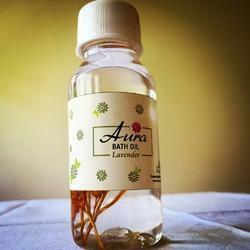 Aura Bath Oils available in Lavender and Rose. To moisturise the skin after a salt bath. Feel pampered and supple. Experience the ultimate in skin care and skin nourishing with this after bath oil which will deeply hydrate and nourish your skin. Loaded with the goodness of lavender oil intensively repairs, protects, nourishes and rejuvenates against the ageing process for a never before radiance. Natural Bath & Body Products (p) Ltd.
Sweet Dreams : For calm and deep sleep. How to use : Apple a few drops to your pillow or on shirt collar before sleep. Can also be used for bath. We are a reputed manufacturer, supplier and exporter of world-class Bath Oil Cosmetics and Perfumes. Inclusive of Skin Care Creams, Hand & Body Lotions and Face & Body Scrubs, we offer optimum quality Skin Care Products. Uses : Relieves Joints pain, stiffness makes body active and fresh, removes toxins and harmful substances from body, remove fatigueness and stress highly effective in chronic diseases. Soft massage with medicated oil. Helpful in rheumatic diseases, paralysis, spondylosis, nervous diseases and disorders. It removes blockages in nerves, strengthen the nerve and toxins are removed from the body. - This blend of Almond & Liquorice oils protects the skin against damaging UV rays. It is rich in vitamin E which is great for the skin and also helps brighten the skin by breaking down hyper pigmentation. Our company has set benchmark by offering Temperature Bath Oilto clients. This product is processed under most hygienic conditions at our processing unit using finest grade quality material and modern technology. Temperature Bath Oilis checked on various parameters to ensure long shelf life and accurate composition.